The Ghostbusters are coming back for a new videogame in 2011, but it's very different from their last one. Atari is trying something new with the sequel to its third-person Ghostbusters shooter developed by Terminal Reality that came out in 2009. For the Ghostbusters' next adventure in the current videogame generation, they're going downloadable in a online co-op brawler called Ghostbusters: Sanctum of the Slime. USA Today got an exclusive first look at the game, which is a strong departure from Terminal Reality's take on the ghost hunting foursome. While Terminal Reality basically made the third Ghostbusters movie, featuring a story written by the films' original authors along with voices from its original cast, Sanctum of the Slime is looking to capitalize purely on the fun that is blasting ghosts with friends. Players will once again take on the role of Terminal Reality's Ghostbusters rookie, but veteran XBLA studio Wanako has taken the reins and raised Sanctum of the Slime's camera so it plays with a top-down perspective. Just as you'd expect from a Ghostbusters game, Sanctum of the Slime will still feature the use of proton packs, in addition to a plasma inductor and the "fermion shock" to capture supernatural horrors. Sanctum of the Slime's coolest feature so far is its inclusion of four-player co-op both locally and online, and the game promises mega-bosses that will require teamwork to defeat. 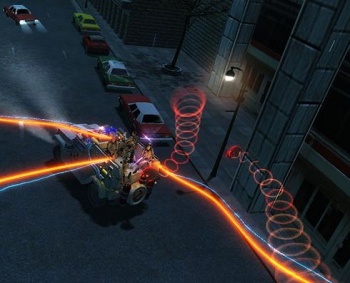 An early screenshot also shows all of the Ghostbusters riding around in an Ecto-Jeep, with three blasting and apparently one driving, which looks fun. USA Today says the Ghostbusters cast is not going to be in the game, but it isn't clear if you'll still take on their personalities or if everyone will play as rookies. Sanctum appears to be an example of the shift in game development that consolidates larger franchises into smaller, downloadable titles that don't cost as much and require less risk, similar to what Square Enix did with Lara Croft and the Guardian of Light. 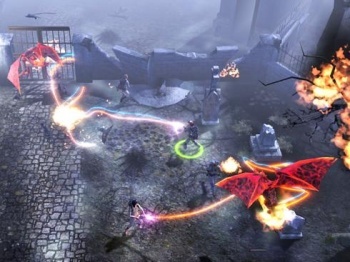 Sanctum of the Slime will be released on the PlayStation Network, Xbox Live Arcade, and PC as a download in spring 2011.